South Bali has become very crowded with locals and tourists. After spending a few days or a week in South Bali, you’ll need to get away from its bustling shops and congested streets. North Bali offers an ideal, quiet retreat, plus the opportunity to get to know the locals better. Here’s a daylong tour of North Bali that takes in two very different freshwater swimming pools; the distinctive Pura Meduwe Karang Temple; Singaraja, the former capital of Bali; and the island’s largest Buddhist Temple, Brahma Vihara Ashrama. This series of large, curving freshwater pools — shaded by huge frangipani trees — is practically unknown to the tourist throngs, and thus perfect for getting to know the Balinese. If you really want to see the local Balinese at play, this is the place to go. It’s one of the last authentic Balinese hangouts. When we visit the pools we are the only non-Balinese there, and thus the object of some attention. Curious kids sidle up to ask where we are from, and why we came to Bali. Precocious teenage hams happily show us their swimming and diving prowess, always with those wide, white, toothy Balinese smiles. The sloping pool sides are constructed of stones inset into concrete, with loose rocks on the bottom making aqua socks a necessity. The locals shelter under tile-roofed pavilions that are raised up a few feet above pool level. The whole poolside area has a very natural look. And the cool spring water provides refreshing relief from Bali’s heat and humidity. We spend hours here. Bliss! A stop at Pura Meduwe Karang provides us with plenty of intricate statues and carved panels to look at — it’s like an art gallery. The temple’s dramatic front is a lengthy wall of life-size statues of warriors and gods, characters from the Indian Ramayana epic, holding long, thick clubs at their sides. Green foliage behind them makes them look like they’ve just emerged from the jungle. It’s an impressive lineup of fierce, snarling faces. 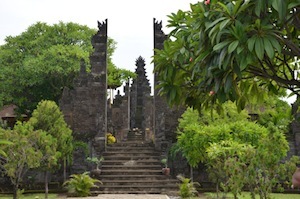 We enter the temple through two sets of ascending split gates (called candi bentar) so typical of Balinese Hindu temples. Passing through the first courtyard we’re told that this is where the villagers congregate for special festivals. But it’s the second, inner courtyard we’re interested in. We stop in front of the temple to admire it. It’s a series of outer pagoda-like shrines guarding a towering edifice at the rear. Ornate life-size stone statues and columns spring up everywhere, and another split gate stands in front of the main shrine. 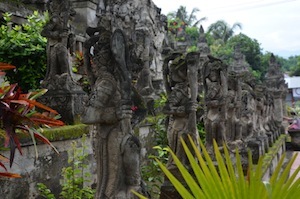 The faces, taken from Balinese legend, are superbly sculpted. A huge winged warrior holding a Kris sword sits atop a dragon-like creature, all carved into the rock wall. The creature is all scales and teeth. I almost expect him to breathe fire. The temple wall interiors are carved with flowery motifs. 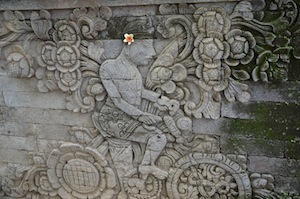 One surprising carving shows a westerner riding a bike. He’s the respected Dutch artist W. Nieuwenkamp. Flowers are inset into the wall behind him. Later that morning we come across a special ceremony at the crowded village temple of Pura Dalem Purwa, located on the north coastal road. Entranced, we watch the villagers coming from miles around on their chugging motorbikes — the official Balinese mode of transport — as they pray and leave their offerings. This temple is a hive of activity as throngs of Balinese women dressed in their multi-colored lace tops balance offering baskets on their heads. Gradually they file into the temple to attend the ceremony and leave their offerings all over the temple. Across the busy road, rows of Balinese men, women, and children sit patiently on concrete and stone terraces, under the shade of huge trees, waiting for their turn to enter the temple. Motorbikes clatter everywhere, often carrying three or four people, the women sitting sidesaddle. Row after row of parked motorbikes encroach onto the street, narrowing it for traffic. It’s chaos, but everyone seems so excited and alive. We drive along the coastal highway to the city of Singaraja. This was the former capital of Bali before the capital was moved to Denpasar in 1855, by the Dutch. This doesn’t seem to have affected Singaraja at all — it’s so busy. Thousands of the proverbial motorbikes and motor scooters zip around everywhere, loaded down with families. 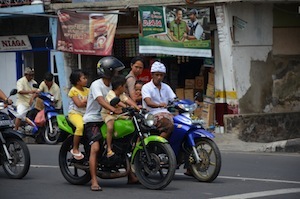 Motorbikes are the Balinese equivalent of an SUV. It’s a wonder these heavily-laden machines, most with 100cc engines, can even move! Singaraja is a hotchpotch of mosques, Chinese and Balinese Hindu temples, worn colonial architecture, markets, and ramshackle storefronts. There’s some history here. The town was a trading center for hundreds of years. It teemed with Chinese, Indian, and Arab traders, all of whom brought their religion and culture here. Singaraja, which means Lion King, is the home of beautiful silver crafts and hand-woven textiles that incorporate silver and gold thread. It’s a fun town, as we wander past the brightly-colored shop fronts, eyeing the wares. 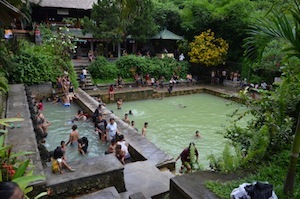 Just inland a few miles in some jungle-clad foothills, we stop at the Air Panas Banjar hot springs. The springs have a different feel to the ones at Air Sanih. Hundreds of pasty white-skinned European tourists and coffee-colored Balinese children, teenagers, and adults soak up the warm, healing water. We visit one small stone pool with a small umbrella covering several small straw offering baskets. The basket table is wrapped in bright orange silk material. Beneath it, spring water surges out into a small pool. Our guide tells us these waters are sacred and health giving, especially good for curing skin ailments. He encourages us to drink them. The water has stained the bottom of the small pool with a reddish tinge, obviously mineral deposits. I drink the warm water and taste the sulfur and iron. Now we move on to view the three main pools. They’re like aquatic beehives, with people standing, talking, washing, and splashing in the 100-degree greenish-yellow spring water. One long, narrow pool sits at a higher level than the large main rectangular pool. Both have concrete sides embedded with stones. Both of the adjacent pools have four huge dragon-like heads sticking out from the walls with floods of water gushing from their mouths. People stand under the dragon’s snouts, washing and getting a pummeling massage. Take the waters and chat with the locals before moving on to see the Brahma Vihara Arama Buddhist monastery, only a few minutes away. Opposite us, on the hillside, is a restaurant, but we don’t bother going over to see it. It’s too crowded. After a half hour viewing this lively aquatic sight, we move on to the nearby temple. After ascending several flights of concrete steps, we enter the temple grounds. 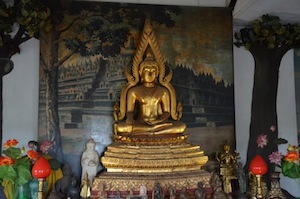 The first temple has a life-size golden Buddha sitting cross-legged. Smaller Buddha statues and deities stand on the altar. Other deities stand nearby on tables. We walk up more steep stone stairs, flanked by four deities on each side, with each step named after a higher level on the ascent to Nirvana. The main temple has a magnificent golden Buddha inset into a highly-decorated recess in the wall. Flowers are arranged to the sides and front of the statue, with shiny brass bowls of fruit placed as offerings. Fragrant incense sticks burn, perfuming the air with frangipani, sandalwood, and jasmine. Elsewhere in the grounds, a large, square, black stone altar holds dozens of Buddhist Stupa domes and Buddha statues. Small, narrow ponds with lilies are arranged in front of the altar. Buddhas stare out from each side of it. The temple is a series of peaceful buildings perched high up on the mountainside. The grounds offer breathtaking views of the surrounding hills, jungle, and town. It’s a great way to finish our North Bali tour. Mimpi Bungalow is a sizeable and well-maintained Balinese villa that stands three stories high and is painted tropical white. The seven rooms, most equipped with a double bed, are spread out on all three floors of the villa, plus there are a few rooms in a side pavilion. The hotel is available only for group bookings. You can rent this slice of heaven for 1,200 euros (approximately $1,600) a week, an absolute steal for the perfect scenery and tranquility. Three or four couples renting this villa together would find it economical and intimate, compared with most other Bali resorts and villas. You should not count on internet access here, which may not necessarily be a bad thing. The Bungalows are a great place to unplug from the ether and enjoy the simpler things of life — like walking down the access road to the open air swimming pools. This is a great place to get to know the locals because you’ll most likely be the only foreigner swimming in these cool pools.